From music to fashion, here’s everything you need to know about DJ Arch Jnr and his incredible rise to fame. Just shy of seven years old, Oratile Hlongwane seems like any regular boy, but there is a lot more to him than meets the eye. Just mention music and he sits up straight, his face lighting up with the biggest smile imaginable. 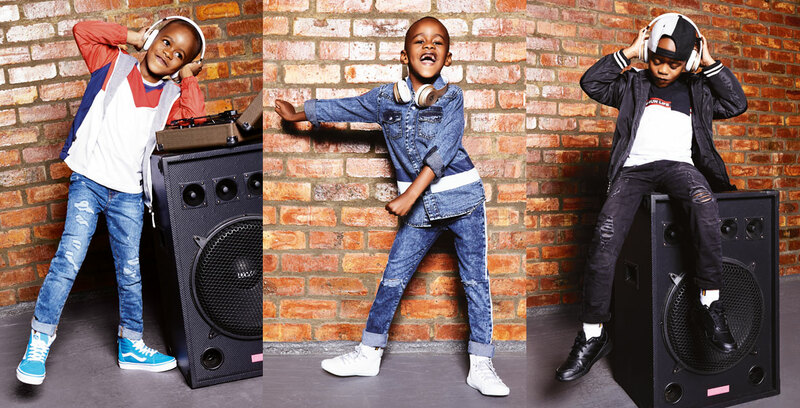 Better known by his stage name, DJ Arch Jnr, Oratile won South Africa’s Got Talent in 2015 at only five years old, becoming one of the country’s brightest young stars. And with the Guinness World Record for the world’s youngest DJ already under his belt, the future is bright for this young music-maker, who stole the hearts of millions of people when he performed on stage at America’s Got Talent earlier in 2019. And while the young star is a musician through and through, it turns out he also has a love of fashion and takes apparel seriously. A few short moments before stepping in front of the camera for his shoot, with an infectious smile, he points out his favourite items, including Chuck Taylor All Stars and a classic denim jacket. From his love of music to his keen fashion sense, here’s what makes him tick. What does it feel like being South Africa’s beloved DJ? (Laughs) South Africa’s coolest DJ? It feels really cool! And it makes me happy. What’s the best part about being a DJ? I like seeing all the people that like my music. What was it like performing on stage? It’s very nice. I like it so much. You even went overseas to America’s Got Talent! Yes, and I want to go again! How much time do you spend on music every day? Lots of time! But, I only make music after school. I’m in Grade 2. I love school. All my friends love my music. My dad taught me music, he loves music too. I also have music lessons. I have two music teachers. My second music teacher teaches me guitar. Is music one of your subjects at school? When you grow up, do you still want to make music? I want to be a DJ that plays the piano and guitar. And also the PlayStation. Do you listen to lots of music? Yes, I listen on my earphones. I listen to the radio, or to music on the computer. Who are your favourite DJs to listen to? I love Black Coffee and DJ Fresh! Why do you love them so much? They’re cool and I like their style! What are your favourite things to help you look stylish? I love PlayStation. I like soccer games; I like playing soccer at school too. I also like superheroes. And if you could be any superhero, who would you be? Batman. I like his costume.